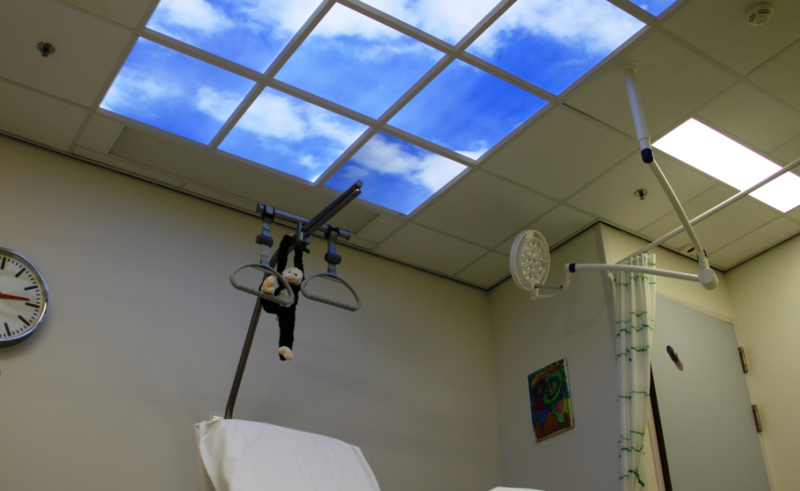 Quality lighting plays a very important role in the healthcare and hospital sector, dramatically affecting the patient experience as well as the staff’s ability to provide the appropriate level of care. LED lighting is a sustainable choice that can not only enhance the care environment in several ways but also cut down energy costs and improve operational efficiency. Root3 Lighting provides the very best in cost-efficient LED lighting solutions for hospitals and healthcare facilities, which nurture a positive atmosphere for patients and provides a dynamic, more productive working environment for the staff. Organisations operating in the healthcare sector are always finding ways to improve the patient experience, while keeping operation overheads at a minimum. Good quality LED lighting can marginally improve your facility’s performance and productivity, and reduce energy as well as maintenance costs in the process. 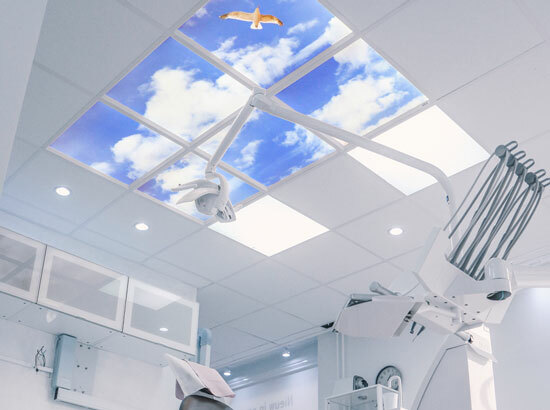 When it comes to hospitals and healthcare facilities, the sheer range of applications are often challenging and diverse – from glare-free workstations to corridors and patient rooms which require safety as well as orientation. The latest LED technology along with intelligent lighting controls can have you reduce energy overheads by as much as 85% compared to regular (and obsolete) lighting. 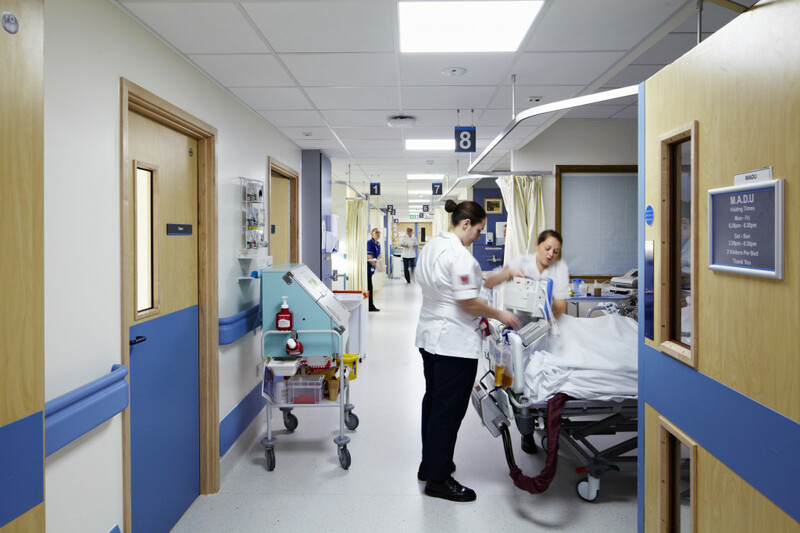 At Root3, we offer a broad spectrum of energy saving hospital LED lighting – combining it with smart lighting controls can not only save you plenty of overhead costs but also free up the hassle of replacement and maintenance. The average lifespan of good quality LED bulbs can easily exceed 50,000 hours. As a healthcare facility owner, you are going to require lighting around the clock, all seven days a well. Our LED lighting for healthcare institutions and hospitals are RoHS compliant – they do not contain heavy metals like mercury. All healthcare facilities are legally required to reduce the use of mercury in their buildings as much as possible. In addition, research has proven that traditional fluorescent lights are detrimental to the environment, given their carbon emissions. We offer top-quality LED lighting solutions for hospitals and all types of health facilities including nursing homes, elderly care facilities, rehabilitation centres, etc. Just imagine the positive impact low-emission, cost-saving LED lights can have on your operating rooms, corridors and entryways, waiting areas, offices, patient rooms, nurse’s stations and even the parking area. LED lights are not only glare-free but also light up the environment evenly, positively contributing to hospital staff productivity levels. Combined with Root3’s smart LED lighting controls, individual levels of illumination can be set for different areas of your healthcare facility, and according to what time of day it is. In short, LEDs offer a mix of light intensity and colour temperatures that are simply not attainable in a conventional lighting system. 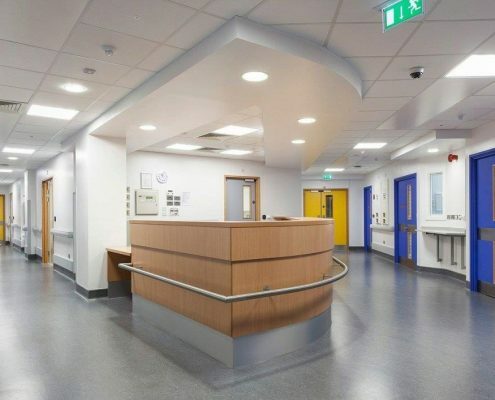 Irrespective of your lighting requirements, Root3 will design the perfect lighting system for your healthcare facility which helps you save thousands of pounds annually while providing for beautiful, patient-friendly lighting.